ADDISON PEMBERTON, a man of many wings. Nobody has given more back to the aviation community or brought more attention to our little "slice of sky" than the man behind such aircraft as the BOEING 40-C, "the Speedmail", and various PT Stearman we so often hear across the Spokane skyline. 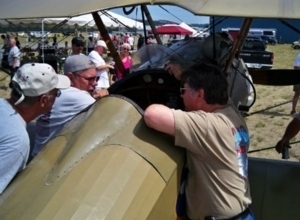 We caught up with this expert builder, and engineer, master restorer (and excellent "classic" pilot) at the GREAT NORTHWEST BIPLANE FLY-IN HEAR THE FULL INTERVIEW HERE!!! includes behinds the scenes, organizing this incredible event, updates on latest projects and airshow HIGHLIGHTS... THEN see the planes in the HOTWINGS PAGE. Just click on the chrome nose-cone marked "hotwings" for the entire album. We're celebrating 30yrs of capturing these machines flying the skies, and beutifiing our finer airports on static display! The band FROM SWORD TO SUNRISE stops by (before leaving for another US Tour) this time HARD-DRIVE LIVE hooks up in the studios with Geoff to talk shop, playing as "baby" Arena Rockers, and making those Rock N Roll dreams come true... Who do you want to open for after touring with ALL THAT REMAINS, LACUNA COIL, MAYLENE AND TRIVIUM? 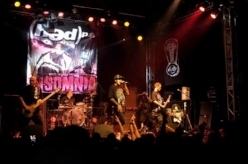 What is it like to see your band on a T-SHIRT? And, who get's 'the groupie chicks' just serious topics covered in this exclussive FREEWAY500 Interview.Homeboys done good and making your daddy proud-to-be-loud! 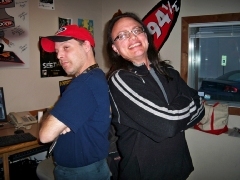 As BORN ANDTHE BRED on LOCAL 9-4-5 with JP WEEKNIGHTS, or heard on the www.Rock945.com local channell. These are our "Rock Hard Moments" with WAYNE STATIC, CHAD FROM MUDVAYNE, and ZAAK WYLDE as we counted down the final days before ROCK HARD II at the Spokane Arena... plenty of Scoops and INSIDE INFO from WAYNE announcing a SOLO CD project, to ZAAK inviting VINNIE PAUL to jamn with his band... And why MUDVAYNE chose our area to complete and write the NEW GAME CD. 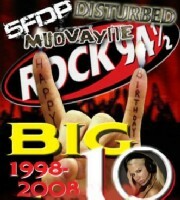 (As featured on ROCK 94.5) *Also; hear STATIC-X take over the radio station on THE FREEWAY500, further down this page! Ivan, the 'original' drummer for WHITE ZOMBIE and guys from GREEN JELLO and we shared some old-times and discuss the newer band KREEP! DOWNLOAD THE FULL INTERVIEW HERE Get up on the band's MY SPACE PAGE to find out even more. Thank you for doing the benefit for the little girl in Idaho. I was happy to hearSean Yassalts new book 'I'm in the band' reported to be released later this fall. 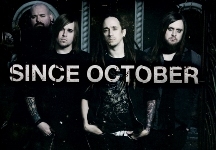 *SINCE OCTOBER SINGER FALLS ILL* band cancels Mosh-Pit Performance. Scheduled to appear opening for HELL'S BELLE'S at the Knitting Factory, SINCE OCTOBER called the FREEWAY500 to apologize for not being able to do the show. "Ben has near strep-throat condition" brother Luke Graham tells Geoff Scott, and hopes to return to Spokane later in the summer to make good the show and meet listeners in another "mosh-pit" type setting. HEAR THE CALL HERE in this exclusive Rock 94 & 1/2 "Web Only" interview. ALSO: A spokane connection is revealed, and background on the bands Swamp-Rock upbringing is also covered. Note: HELL'S BELLE'S show is still on! Check this page, below, for exciting clips & photos with THE BELLE'S... "the band Angus listens to!" Here on the FREEWAY500 AUDIO PAGE. Feel better soon, Ben! Stopping by the ROCK STUDIOS SEATTLE SEAGALS help Geoff Scott put the 'cheer' into HOOPFEST 2009 SEE THE PICS here and listen to the audio below, remember your 3 on 3 basketball team needs to be signed up soon! And with these gals waiting on your sideline to root you on, what are you waiting for? The ladies have some great snack recipes, too, on their Wa Dairy Assoc WWW.SEAGALSNACKS.NET page and a fitness test to see if you can out-fit the SEAGALS. Goodluck... we had to have medical asst after 3 minutes of their workout~ And that was just watching them do it! WO. After a noticable hiatius of 7 yrs, STICKMAN CAUGHT ON TAPE Stops by THE CLUB EDGE to celebrate their grand opening with a special JAM WITH THE BAND. Stickman, who performed on the radio "Jam with the stars! ", has been laying low as he told THE FREEWAY500 ROADCREW; "As the only non-self-combusting drummer to audition for Spinal Tap, I had been enjoying some down time & keeping away from pyro-technics. (then) THE EDGE gave me a call, and I (had) recently purchased a fire-suit~ so I figured what the hay!" The crowd really seemed to enjoy the show, and only two people were treated for minor eye injuries from Stickman's trademark wild stick-flangings. WE GET 'THE DOPE'... ON DOPE! Edsell Dope of DOPEstops by on a Friday The 13th, to celebrate ten years of rockin' the undergound, and writing the songs we love to play in video games, WWE, movies, etc. 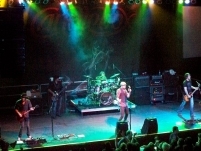 Finally gets some 'center stage' time opening for Zaaks'BLACK LABEL SOCIETY BASH at The Factory. Dispel the rumours, and lets make some new ones! Features the new track ADDICTION and we can't get enough. GEOFF TATE of QUEENSRYCHEstops by the Friday Flamethrower to WORLD PREMIER the new disc 'American Soldier' exclusively on Spokane's Best Rock, and talks about the making of this heart-felt tribute to Americas War Veterans. Interspersed with commentary gathered while speaking one on one with hundreds of GI's the music says these words that are too deep for many to express. Geoff Tate discovers an inner respect and deeper gratitude for the men and women of our nation's armed forces... And it rocks!!! Hell's Belle's & Rock 94.5 thanks EVERYONE who donated TOYS FOR TOTS! Congrats to our grandprize winner Virgil Aden of Spokane, your 'Guitar is in the mail'! (signatures are from Hell's Belle's AND Egypt Central from Rock Hard @ the Park concert). Rumours of an early spring or late-winter return. **you are viewing this site in the SMALL SCREEN FORMAT, you may wish to adjust your browser to 800x600 for best browsing experience.